A Robeson county official confirmed a temporary berm in Lumberton has been damaged and urged residents to "get out now." LUMBERTON, North Carolina — In the days before Hurricane Florence struck, officials and residents here scrambled in an effort to minimize the impact of flooding that the massive storm would bring. They used sandbags to plug a gap in the levee on the southwest side of town. And on Sunday, crews with bulldozers worked frantically to reinforce the temporary berm in hopes of holding back the floodwaters. It was here that waters from Hurricane Matthew entered town in 2016, devastating entire neighborhoods. The makeshift wall ultimately could not withstand the powerful rains that have been unleashed by Florence, now a tropical depression. Emily Jones, a spokeswoman for Robeson County, confirmed that the barrier broke around 2 p.m. Sunday afternoon. The levee remains intact. Jones stressed that residents in low-lying areas “need to get out now.” A mandatory evacuation order is in place for the south part of town. At the city water plant, which lies just east of the levee gap, Lumberton’s public works department used excavators in the days before Florence hit the coast to construct a giant berm around the facility’s water pumps and backup generators. The infrastructure was inundated during Matthew, and it took weeks and around $2 million to get the plant back online, according to Corey Walters, the deputy director of public works for the city of Lumberton. “We’re throwing everything we got at it,” he said of Florence on Thursday. Workers with Duke Energy move through Lumberton, North Carolina, by boat in attempts to restore power to customers on Sunday after intense flooding in the town. 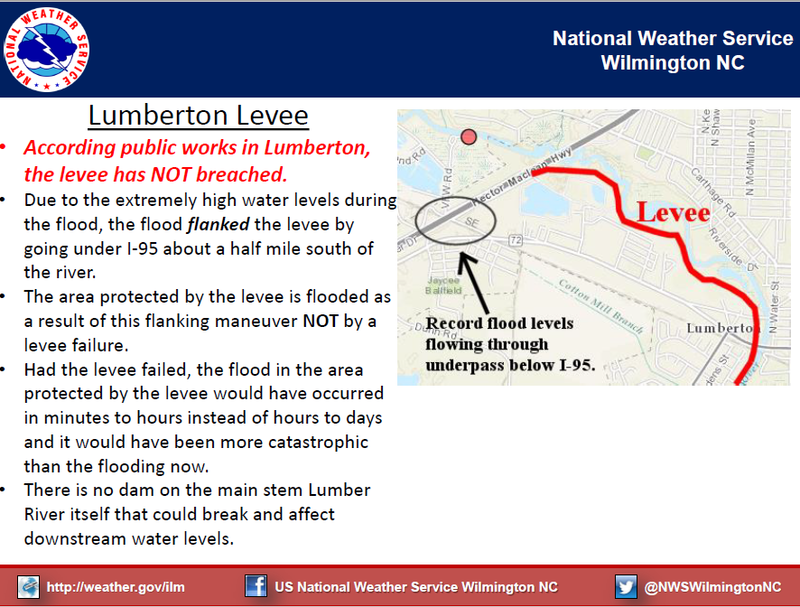 The Lumber River crested at more than 24 feet during Hurricane Matthew in 2016, highest in history according to the National Weather Service. Water flowed through an underpass beneath the I-95 highway during that storm and caused catastrophic flooding that displaced more than 1,500 residents for months. About 27.8 percent of county’s residents lived under the poverty line in 2017, more than twice the U.S. Census Bureau’s national rate of 13.4 percent. Lumberton residents in the low-lying areas surrounding the river ― the most likely to lose their homes ― are in one of the poorest communities in Robeson County. Jeff Wade moved to Lumberton from Lynchburg, Virginia, in February 2017 to help with Hurricane Matthew recovery and has been helping to rebuild dozens of homes flooded during Matthew. “I worry that Florence may be more than people can handle,” Wade told HuffPost on Thursday. Lisa Hardin’s home is located on the bank of the Lumber River, among the flood-damaged homes on the south end of Lumberton. It took Hardin nearly two years after the devastation of Matthew to rebuild her life, she told HuffPost on Thursday ahead of Florence’s landfall.